Flaherty Fardo, LLC helps victims injured in a broad range of construction accidents. One of the most important question in these types of cases is the status of the worker at the time of the accident. Were you a Guest, Subcontractor or Employee? If you or a loved one was injured in a construction accident, whether the injured individual was an employee of the company, a guest of the property owner, or a subcontractor working could make an enormous difference as to how Pennsylvania law mandates the case is handled. If the injured individual was an employee of the construction company, then the Pennsylvania Worker’s Compensation laws may apply as indicated below. However, if the injured individual was a guest of the property owner, or a subcontractor, different legal principles may apply. Under these circumstances, worker’s compensation rules may not apply, and the injured individual instead may seek legal recourse and monetary recovery through the civil courts by filing a personal injury lawsuit. Having experienced construction accident attorneys is important to fully understand your legal rights and to understand the key legal implications involving insurance and the appropriate entities responsible. Workers’ compensation exists to provide benefits for U.S. employees. People that have suffered a work-related injury in a construction accident might be entitled to receive workers’ compensation for the injuries they have endured.The workers’ compensation benefits may include payment of medical expenses and compensation for any lost wages. In addition, workers’ compensation can be paid to an employee’s dependents if they die from a work-related injury or disease. With some very narrow exceptions, the question of negligence (fault) is not an issue if a worker is hurt on the job. Whether or not the employer is at fault has no impact on the worth of a case. the right to receive payment for any after-effects of the injury if the after-effects are found to be permanent (partial permanent disability). If you are injured in a Pennsylvania construction accident, you should immediately report the accident. Make sure an accident report is filled out and write down the names of all witnesses. To learn more about Workers’ Compensation Laws in the State of Pennsylvania contact the Pennsylvania Department of Labor. 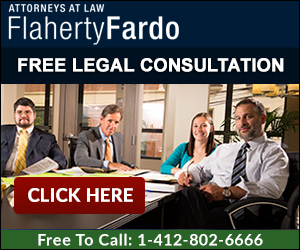 If you have any questions about a case involving a construction accident, Flaherty Fardo offers free consultations. Consultations can be done on-line or by calling our offices at 412.802.6666.